Well it is Friday lunch time and as I’m at work and that means I have my semi-regular visit to Subway. 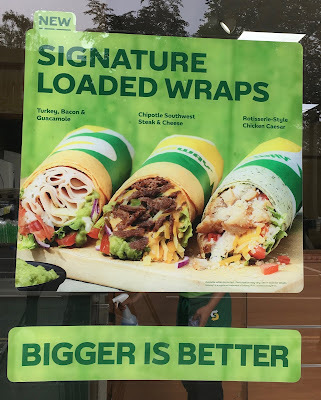 When I arrived I spotted a poster in the window showing off Subways’ new range of Signature Wraps, and I opted to try out the Turkey, Bacon and Guacamole variant. I chose this one as it sounded quite healthy, and also because avocado and guacamole are really in at the minute, they are seen as being a bit hipster. The lady making it started out with a round wrap, which was flavoured with tomato and basil and it was a slight orange in colour. She spread guacamole and then stacked up on it turkey, bacon, cheese and then asked the usual requirements over salad, where I added lettuce, tomato, cucumber and olives. She said the recommend sauce for this wrap was Ranch, so I went with that. She folded it all over and confessed that when she had sliced some before and they had a habit of falling apart and she would have to start again. Perhaps this justifies the £5 price for a single wrap, which is quite pricey for Subway. Oh well, I started by trying a little bit of the wrap on its own and found it to be lovely and flavoursome the tomato and herbs did stand out and made an excellent base for this wrap. The guacamole was mild, but had a nice avocado flavour; I’d have just liked a bit more seasoning in it. As a whole though the wrap really came together, the turkey and bacon were filling and the ranch dressing made this a tasty wrap. Each mouthful was different with varied texture from the meats and salad. 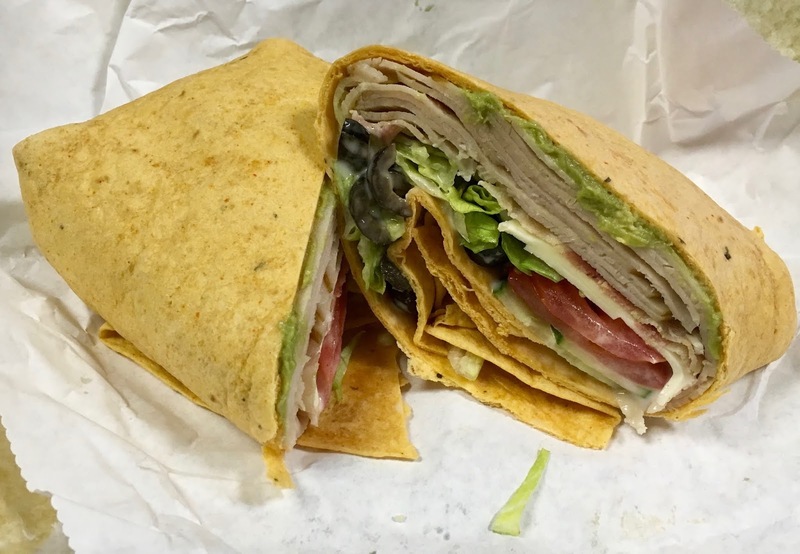 I was pleased that the wrap held together and it was surprisingly easy to eat, and I didn’t lose any filling. The flavours were lovely together, there was lots of flavours and meatiness and the wrap did make it fun to eat. It is something I would have again, even at the higher price (for a non-toasted take out) lunch.